Found in Durham by Sid Liddell. 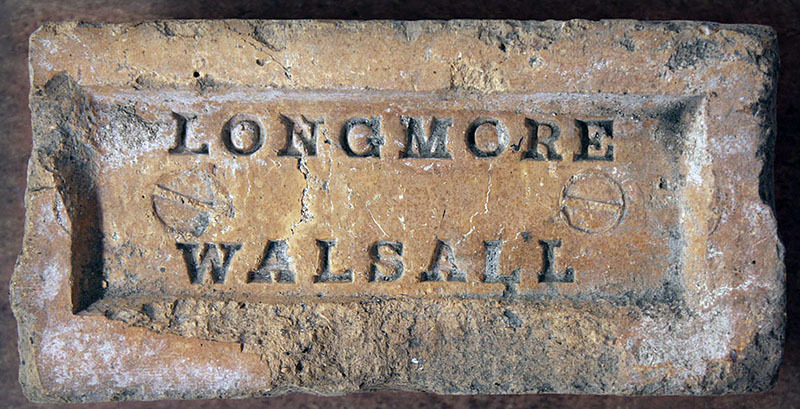 The Lightwood Brick & Tile Co. Ltd is listed in Kelly's 1928 to 1940 editions at 6, King Street, Longton, Stoke. Found on a 1938 OS map that this works is shown just off Stone Road, Lightwood, Longton. Info & Photographed at Apedale Heritage Centre by Martyn Fretwell. Lilco, probably made by the Lilleshall Company, photo by Frank lawson. Photo by Martyn Fretwell courtesy of the John Baylis Collection. The brickyard was established in about 1901, when Priestman Collieries Ltd took over the Lily Drift. Brick production reached a peak in 1955 at about 150,000 bricks per week, mostly for use at local pits. 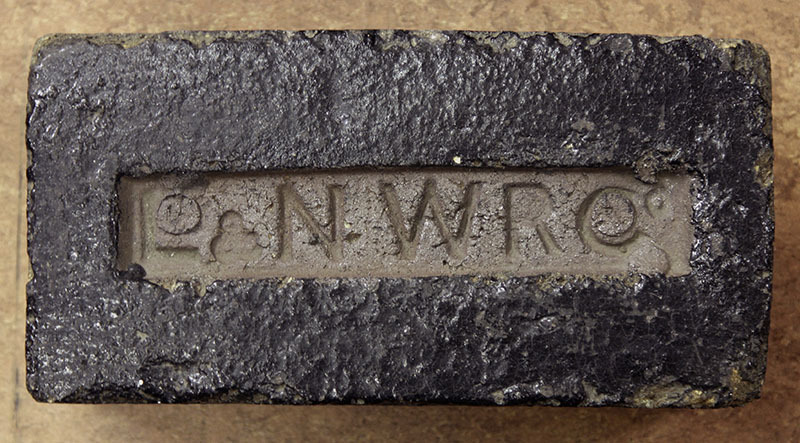 After 1964, high quality facing bricks were produced and were widely used in the North East, as for example at the Airport Hotel Ponteland and the Nuffield hospital, Jesmond. The brickworks closed in 1976. See also NCB Lilley. Photo and info by courtesy of the Frank Lawson collection. 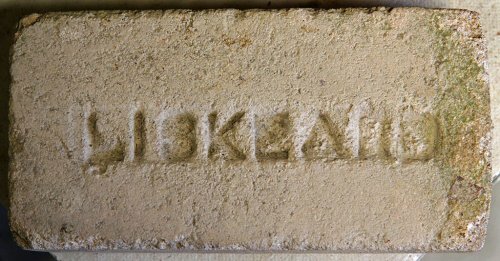 This Lily brick was photographed by Martin Briscoe in a display cabinet at Newhaven Fort, Sussex. 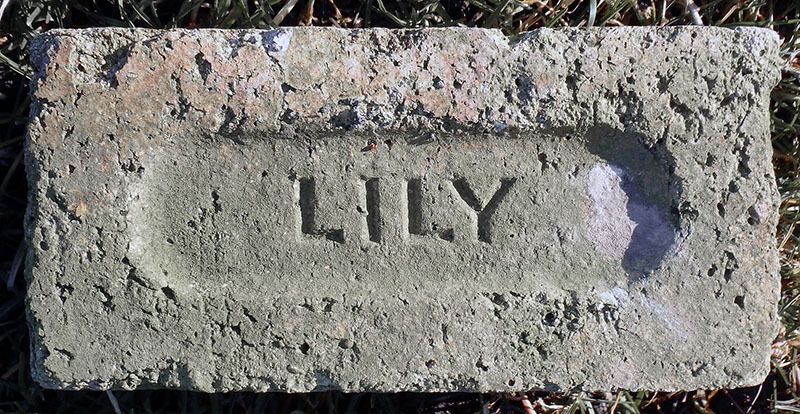 It is possible that Lily were actually the makers of the brick machinery. Linby Brickworks, Wighay Road, Linby, Notts. is shown as being on the edge of the village on the 1875 OS map. The works or it’s owners are not listed in any trade directories that from around 1875 & only the claypit is shown on the 1887 OS map. Today the houses built on Peverel Road occupy this site. Info & photographed at Papplewick Pumping Station near Nottingham by Martyn Fretwell. A W: Albion works, Long Heys Road. Photos by courtesy of the Frank Lawson collection. 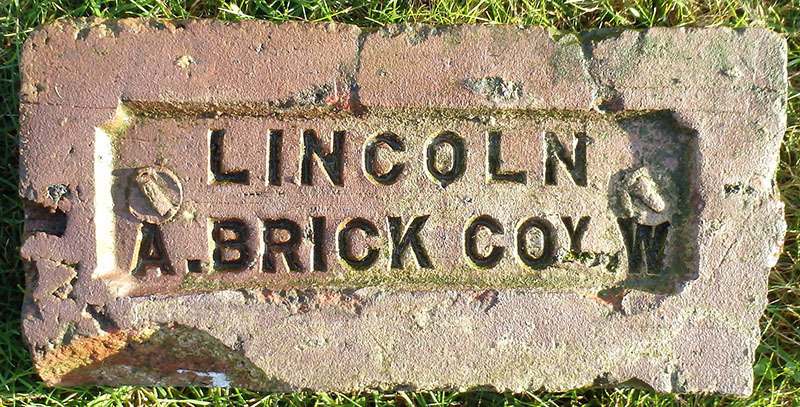 Lincoln Brick Co. operated five works during it's lifetime which spanned from 1882 to 1975. These were at Waddington near Lincoln; West Cliffe, Burton Road, Lincoln; Albion Works, Long Leys Road, Lincoln; Cross O'Cliffe, Bracebridge & Brant Road, Bracebridge. Photos & Info by Martyn Fretwell. Found Barnby in the Willows, Newark, Notts. 2016, R Lineker, Balderton, Newark, Notts. Post Office Nottinghamshire Directory 1855. Found by David Ashford, info by Frank Lawson. Made in Lingfield, Surrey. Photos by Richard Symonds. Lintz Colliery Company, Burnopfield, Co. Durham. One of Durham's smaller colliery concerns, which via a series of owners operated in various forms from the mid 1850's to around 1924. The associated brickworks was an even shorter lived concern, being in production for no more than 20 years from the late 1880's. 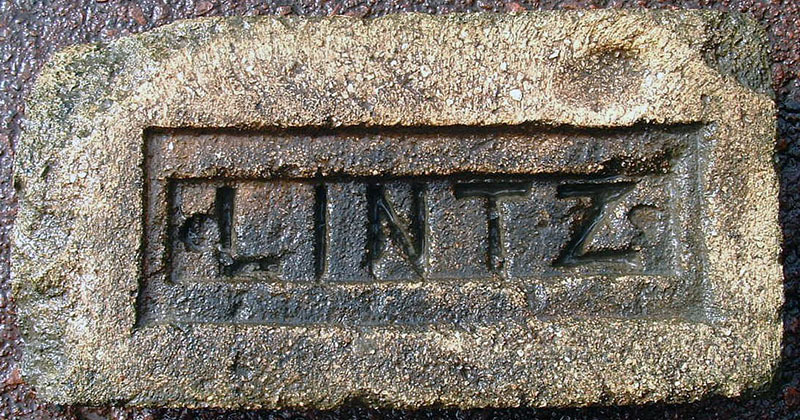 However, despite the relatively small size of the operation and its limited lifespan, I've recorded at least three distinct renderings of the 'Lintz' brand, with of course variations on the theme! Photo and info by Arthur Brickman. Thanks to Darren Haywood for the photo. Found on a a rough path on the Middleport pottery site, Burslem by Ken Perkins. Photo by Richard Symonds, taken at Amberley Chalkpits Museum. Carkeet Brickworks SX218732. Photos by David Kitching, part of the collection at Wheal Martyn China Clay Museum. Photo by Mark Cranston. One of Tyneside's pioneering brickmakers, reference to their first business venture is made around 1827 with the establishment of a brickyard at Low Benwell on the River Tyne, it's address being 'Benwell Fishery' and no doubt the rationale for the adoption of the impressed 'Salmon' trade-mark, which was carried on by their successors when their interests were sold in the 1860's, by which time they had two yards at Scotswood further west on the river; the Low Yard which employed some 50 hands, producing firebricks as in this example. Added info by Arthur Brickman. 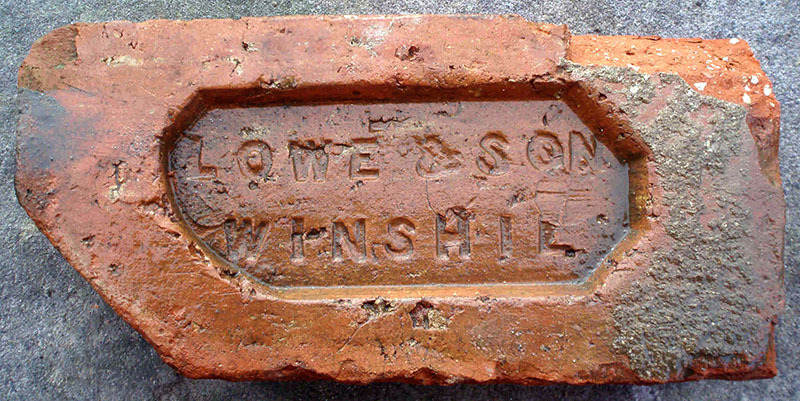 The Winterton family acquired land at Bordesley Green, Birmingham & established the Little Bromwich Brick Co. in 1899. 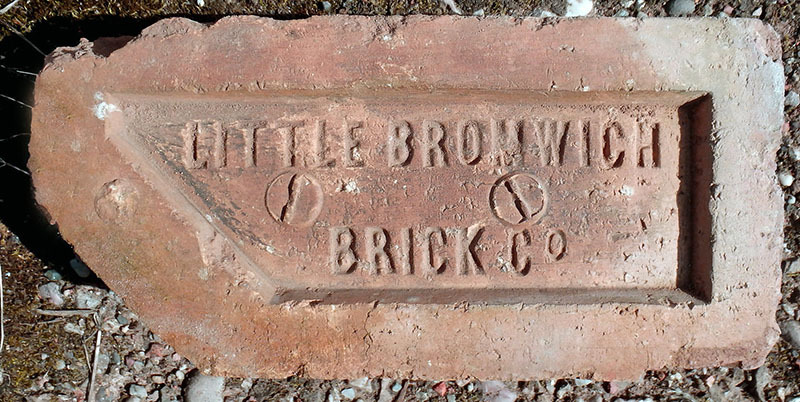 The Little Bromwich Brick Co. is listed in Kelly's 1899 edition with John Henry Weston as managing partner. This entry is repeated up to the 1913 edition. Kelly's 1915 edition lists a second works at Black Pit Lane, Ward End (now St. Margarets Avenue). The next trade directory that I have for Birmingham is the 1940 edition and it still lists the Little Bromwich Brick Co. at Bordesley Green. The company went into liquidation and was voluntarily wound up on the 15th October 1951. Photo & Info by Martyn Fretwell. 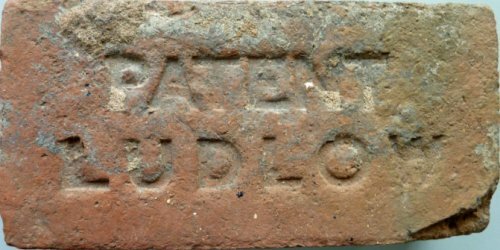 Lloyd & Son were first recorded as brick and tile makers in 1872, with the last record in 1886. The next record from 1892 indicates that Mark Lloyd, a son born about 1848, was then owner of the brickworks. Later records exist for 1916 and 1926-27, with the last record being in 1930. Kelly's directory for 1908 records Lloyds Brickworks Ltd as being located at the Sutton Old Yard and Wheatmore brick works, Sutton Old Yard being at Town Station. An O.S. map of 1889 shows a brickworks with three marl holes in the area between Bedford Road and Whitehouse Common Road, an area now covered by housing. It shows four rectangles, three estimated about 40 - 50ft long, one 100 - 125ft long, marked as kilns. Other buildings and what could have been a wagon track for hauling tubs up from the quarry are also indicated. 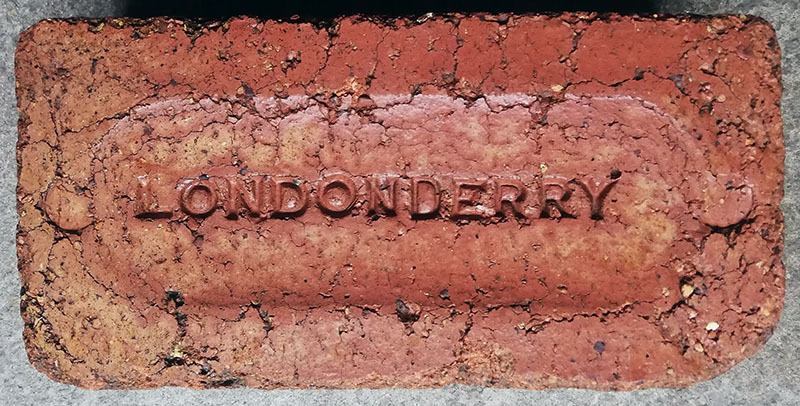 A large quantity of bricks would have been needed for the construction of the Park and Town stations, both opened in 1879, and the larger kiln could have been constructed around the mid 1870's producing bricks imprinted "Lloyd & Son". 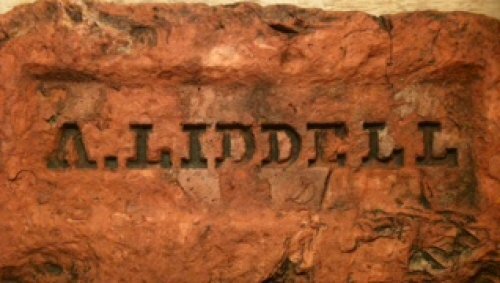 A local reclamation yard had only one "Mark Lloyd" brick so where did all the bricks that were produced from about 1890 until the closure of the works around 1930 get used? Do they still survive in the area or have the buildings built with them now been demolished? 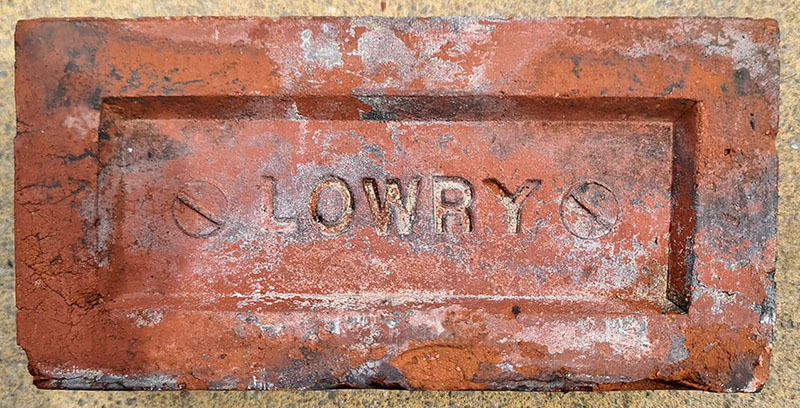 This brick would have been produced after about 1890, after the son Mark Lloyd became the owner of the brickworks. This followed the death of his father, Charles Lloyd, born about 1815. The 1891 census records that Dinah Lloyd was then a widow living with Mark and his wife. Photo and info by Ray Martin. W. Loach & Sons are listed in Kellys 1879 & 80 editions at the Beech Lane Brickworks, Quinton, Birmingham. Photo & Info by Martyn Fretwell. 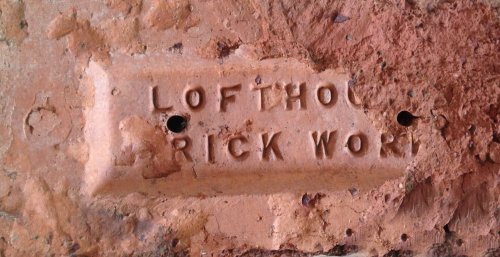 The Whitemoor brickworks had a complex history until 1872 when Walter Lockhart took it over and ran it until 1886 so the age of this brick is quite well defined. 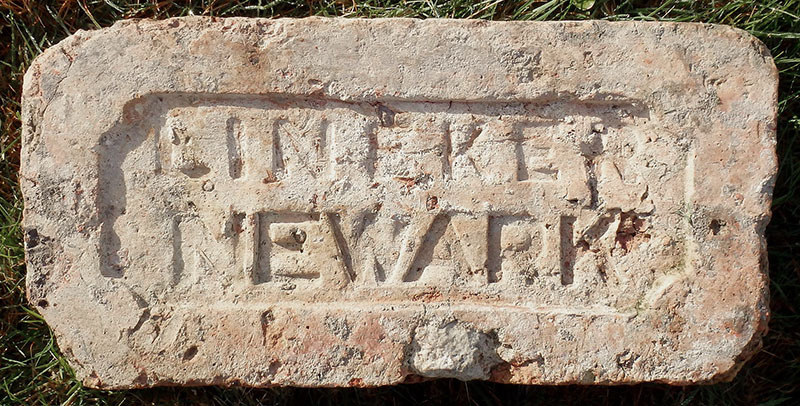 These were the first bricks to include the town's name. Thanks to Robin Leach for the photo and info. Photo by courtesy of the Frank Lawson collection, found near Penistone. Philip Rothery writes that this a product of Lockwood & Elliott, Woodsome Sanitary Pipeworks, Fenay Bridge near Huddersfield. The Lodge Colliery brickworks is first listed in Kelly's 1881 edition as William Hall, Lodge Colliery, Newthorpe. The entry in Kelly's 1885 edition reads William Hall, Gilt Hill, Kimberley. Kelly's 1888 & 91 editions is the same listing as the 1881 entry. White's 1894 listing is William Hall, Kimberley. Then the last two listings are William Hall (exors. of), Lodge Colliery, Newthorpe in Kelly's 1899 & 1900 editions. Lodge Colliery together with it's brick kilns are shown on the 1879 map, so it appears that the brick yard had just been established at this date & it coincides with the first trade directory listing for this yard in 1881. The 1913 map no longer shows neither the colliery or brickworks & trees are shown planted on most of this site. Today the Birch Industrial Estate has been established next to the A610 on the part of the site where the colliery & brickworks had stood. Photos by Ken Lord & Info by Martyn Fretwell. Photo by courtesy of the Frank Lawson collection. Lofthouse Park provided entertainment for the masses, 1908 - 1913. It was opened by the Yorkshire ( West Riding ) Electric Tramway Company and was situated at Lofthouse, 4.5km north of Wakefield, West Yorkshire. 'In the 1930s, Roper Brickworks moved into the Park across the road' Source: Peter I Wood, Lofthouse Park, in K. Taylor (edit) Aspects of Wakefield 1998. Image PRBCO. 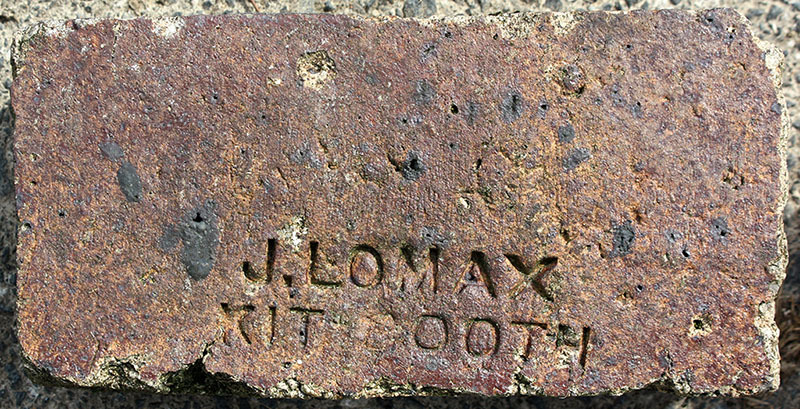 John Lomax & Co was working on Rooley Moor above Rochdale from the 1860s to the early 1890s. 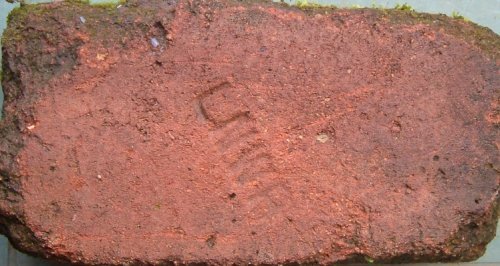 Although no details of any brickworks has been located in the immediate area, Kit Booth was a smallholding close to some of these and it is likely that this firebrick was produced at a kiln in the vicinity. It has been estimated that a third of all the brick houses in England are built from London Brick Company bricks. 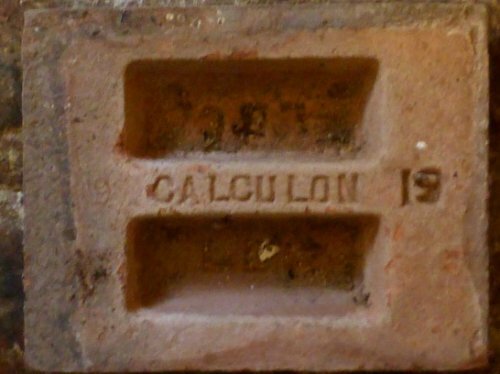 The London Brick Company started production just over a century ago and usage peaked in the Post-War rebuilding period up to the Nineteen Sixties. Maximum production rose, at one point, to an amazing 16,000,000 bricks per day. In other words - quite common bricks! 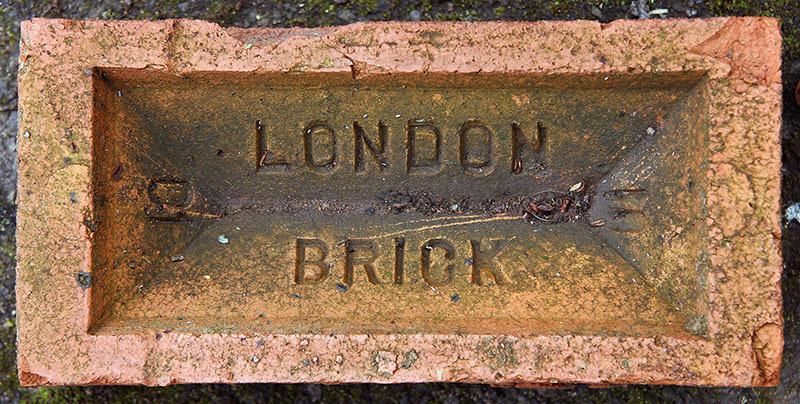 there are a lot of photos of the London Brick Company on this Flickr site. 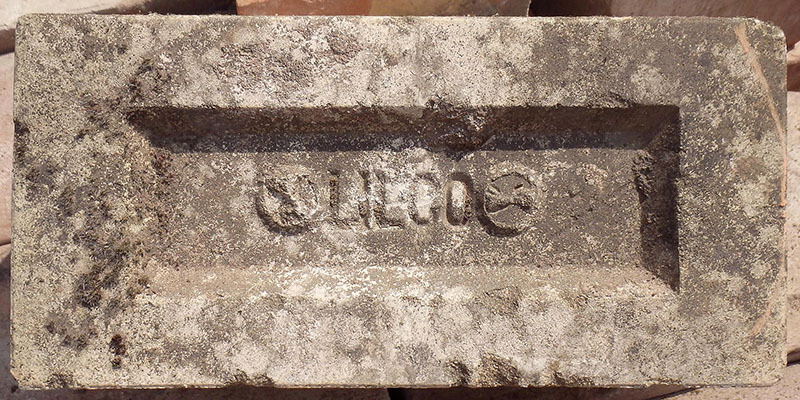 The early brick presses only applied two presses to the powdered clay in the brick moulds. 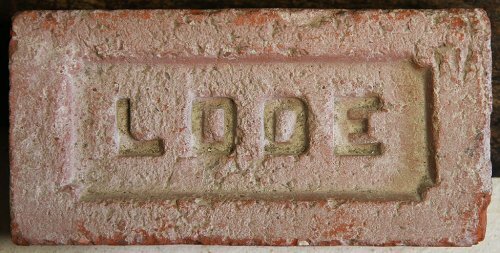 The trade-name Phorpres came about because Fletton Bricks made in Bedfordshire are pressed twice in each direction so that they are literally 'four pressed' if the phrase is pronounced quickly it becomes Phorpres! Thanks to David Kitching. 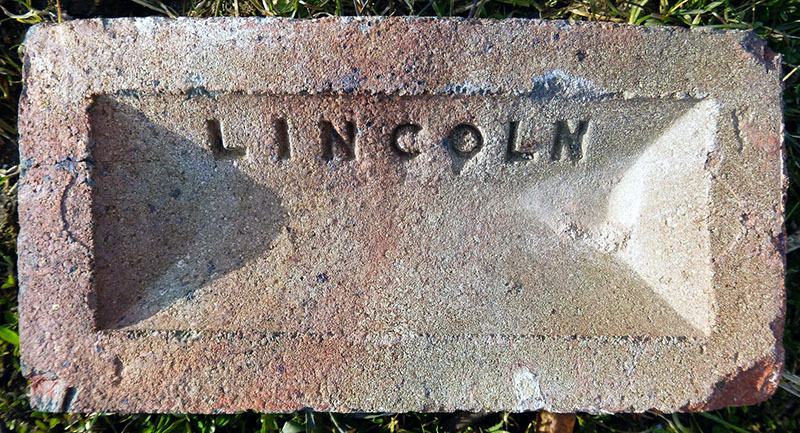 A commemorative brick by LBC, Thanks to Simon Patterson for the photo. A Charles and Diana commemorative wedding brick, photo by courtesy of the Frank Lawson collection. Photo by courtesy of the Frank Lawson collection, found near Woolsthorpe, Notts. Another of the Hanson casualties in 8/1984. Situated near Ramsey, Cambs and started 1886 by Alfred Fuller; Warboys Brick Works Co until 1933; LBC & Forders Ltd until 4/1936, then LBC. 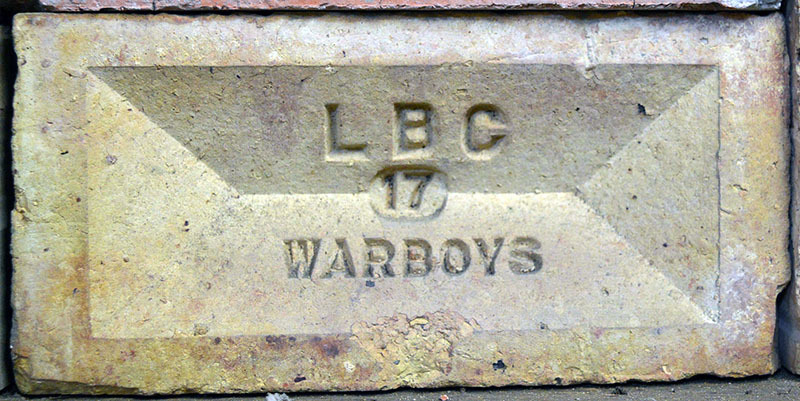 A 'Warboy's White' - they went over to land-drain pipes and hollow bricks 1950s. Now a tip. Additional info by Chris Fisher. Found near Grimsthorpe Castle in Lincolnshire by Frank Lawson. Found at Snettisham, Norfolk. 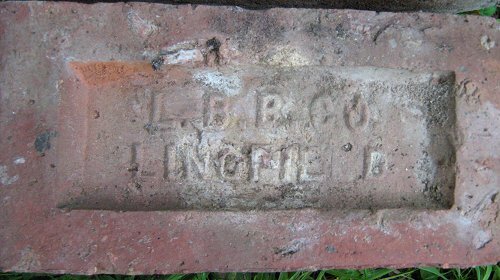 Probably made by LBC after they bought the Dogthorpe Star brick works in the 1920s. Photo and info Chris Dixon. Showing the 40th anniversary of the accession, 1952 - 1992. Found in Cambridgeshire by Barry Wilson. An old style LBC example, photo by Nigel Furniss. These bricks were made as a low cost alternative for load bearing party walls. Info & Photo courtesy of the Bill Richardson collection at Southwick Hall by Martyn Fretwell. 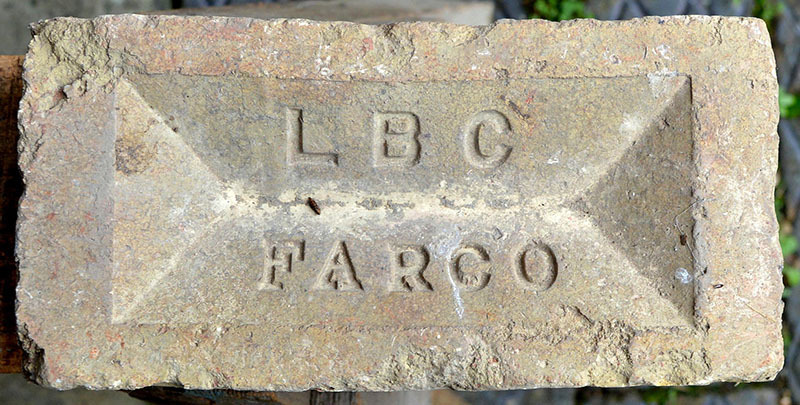 Made at the former Farcet Brick Co.'s works, near Peterborough. See Farco entry for info. Photo courtesy of the Bill Richardson collection at Southwick Hall by Martyn Fretwell. Photo courtesy of the Bill Richardson collection at Southwick Hall by Martyn Fretwell. A tapered Phorpres marked 8ft diameter. Found at an old paper mill site in Barrow in Furness by Richard Cornish. The London and North Western Railway even made its own steel at Crewe, so brickmaking was almost a given. The 1876 1:2500 OS map shows a large round kiln near to West Street in Crewe along with rectangular kilns within the works buildings adjacnt to the Chester line. By 1898 the rectangular kilns had gone and the round kiln had a standard gauge siding entirely circling the structure. There were also four more smaller round kilns nearby. Info by David Kitching. 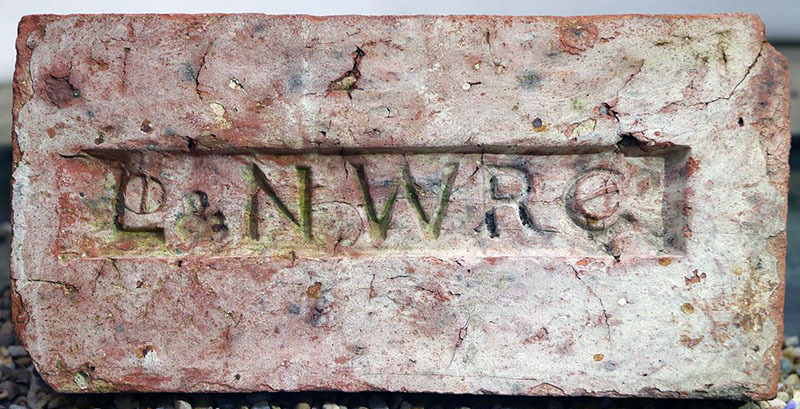 The L.N.W.R. was always willing to save money where possible and self sufficiency was the byword. 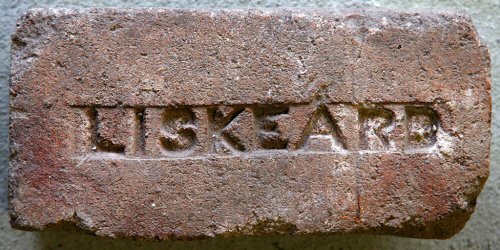 In the mid 19th century bricks were often made on a building site, especially when large buildings were under construction. In a large enterprise like a railway new buildings were regularly required throughout the country, all needing large numbers of bricks. Large scale brick making began at Crewe in 1862 using clay from the cutting between the south end of Crewe station and Whitmore. The company had been paying 24 shillings per 1,000 for bricks from outside suppliers whereas company-made bricks cost just 16s.2d per 1,000. The bricks were handmade and so a lot of labour was involved. Around the kiln is a line of rails, upon which the ordinary railway trucks run, and the finished bricks are loaded direct from the kiln into them, by two men who fill their barrows, wheel them to the trucks, and pile the bricks carefully inside, for 5.5 pence per thousand. One thousand bricks weigh three tons, and considering that this weight has to be moved twice and wheeled about fifteen yards, it is not a high rate. Webb was so pleased with the success of the venture that he doubled Aspinall's salary. Info from the Wolverhampton History & heritage Website. Found near Gayton on the disused S.M.J.R. line by Nigel Furniss. Photo by courtesy of the Ian Stubbs collection. Londonderry Collieries, County Durham. Long Buckby is a village in Northamptonshire. Photo by Andrew Farthing. Commemorative brick. Photo by Richard Symonds, taken at Amberley Chalkpits Museum. Possibly Joseph Longley, 1848 - 1857/8, whose yard was at Hunslet Road, Leeds. Found within the rear wall of the Clarence Iron & Steel Works by the Aire & Calder Navigation, Leeds. Image PRBCO. 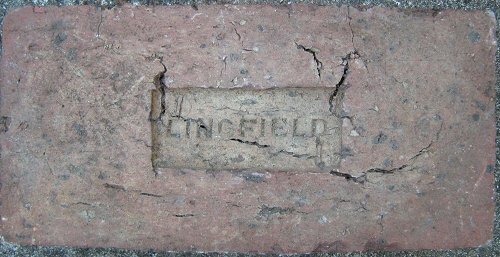 The Longmead Brick Works was located in Bishopstoke Hampshire. Photo courtesy of Bishopstoke History Society. 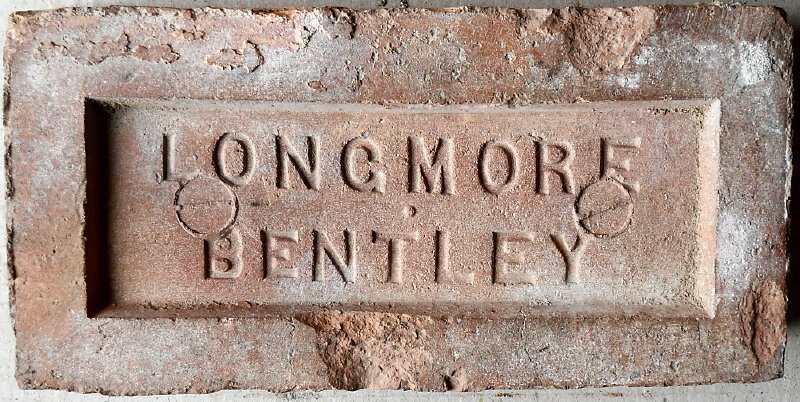 William Longmore, Hopyard brick works, Bentley, Walsall. The works appears in the trade directories at the beginning of the 20th century and has gone by 1940. It was situated on Bentley Mill Lane at the junction of the Anson Branch Canal and the Bentley Canal. Photo and information by David Kitching. Photo by Colin Wooldridge from the John Cooksey Collection. 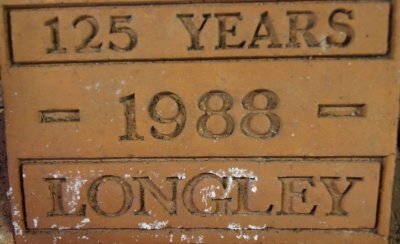 Martyn Fretwell writes :- In Kelly's Directories, William Longmore is listed at the Hopyard Brick Works, Bentley, Walsall in the 1904 to 1940 editions. Company dissolved in 1955, possibly associated with William Palmer's Longport works which may have been on Davenport Street in Longport. Photo and info by David Kitching. May have been made by J. Bettany, High Street, Longton in 1860, there is an entry for this maker in Kelly's Staffs. 1860 edition, but he is listed as J. Betteney, High Street, Longton. Info & Photographed at Carwarden Reclamation Yard by Martyn Fretwell. Photo by Roger Grimshaw, taken at Gladstone Pottery Museum, Stoke on Trent. 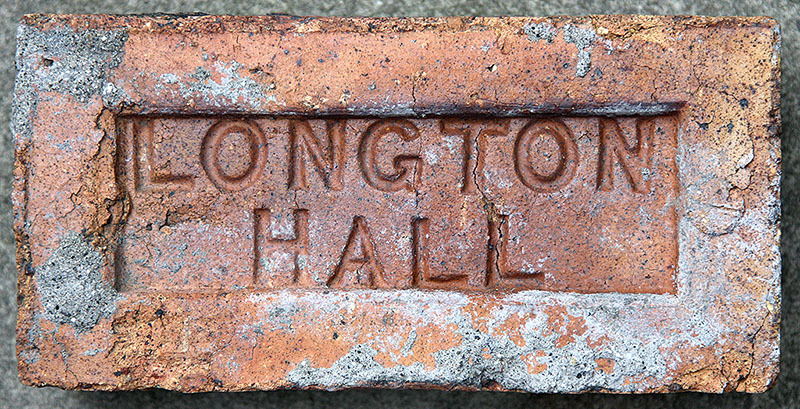 Longton Hall Co. Ltd.,(George A Mitcheson receiver & manager), Longton Hall Collieries, Longton & Fenton, Stoke. From Kelly's Staffordshire Directory 1896. Info by Frank Lawson. 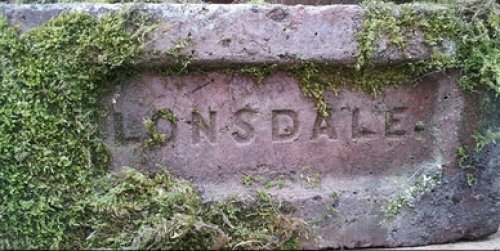 Lonsdale Brick and Tile Works, Cumwhinton, Carlisle. Photo and info by Mark Cranston. Hannafore Brickworks, West Looe SX255523. Photo by David Kitching, part of the collection at Wheal Martyn China Clay Museum. 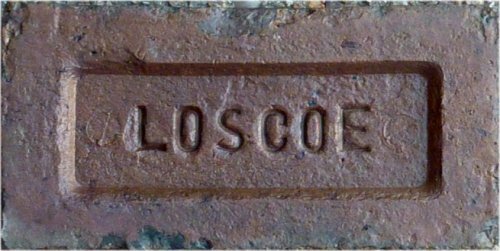 The Loscoe Brickworks was on Heanor Road, Loscoe, Derbys. and was in production from the 1880's to January 1976. When the clay pits were filled in & built over, a build up of methane gas from the material used to fill in the pits resulted in an explosion, destroying a bungalow. Fortunately without loss of life. Info & Photo by Martyn Fretwell. John Loughton is listed in Kellys 1892 & 1900 Warks. editions at Solihull Lodge, Birmingham. His son John junior (see below) is also recorded as owning a brickworks on Garrison Lane in Birmingham. Info & Photo by Martyn Fretwell courtesy of the John Baylis Collection. John Loughton junior is listed in Kelly's 1892 to 1900 editions with works at Garrison Lane & Yardley Wood, Kings Heath, Birmingham. John had taken over the Garrison Lane works from George Payton who is first listed in Kelly's 1867 edition. From Kelly's 1878 to 1883 editions the works is listed as George Payton (exors of), so John purchased the Garrison Lane works sometime between 1883 & 1892. Info & Photographed at Oldfield Reclamation Yard, Old Hill, Cradley Heath by Martyn Fretwell. This was made by Joseph Love and Partners who owned Shincliffe Colliery and Brick Works which was about a mile south of Durham. Joseph Love (1796 -1875) was also a partner in Straker and Love (S&L in your listing), Ferens and Love (F&L), Love and Partner (L&P). Thanks to David Oliver for the photo and history. Love & Partner, see above entry. Found Overton, W.Yorks. 2014. Low Laithes Colliery Co., Low Laithes Colliery, Gawthorpe, Ossett, West Yorks. Kelly's West Riding Directory 1912 & 1917. Photo and info by courtesy of the Frank Lawson collection. Lowe & Sons, Shobnall Road & Ashby Road, Winshill, Burton upon Trent. Photo supplied by A.K.A. Demik. Started by Thomas Lowe in 1846, the brickworks is recorded in the 1857 edition of Kelly's Trade Directory. The company changed it's name to Lowe & Son in Kelly's 1880 edition. The 1896 edition records Lowe & Son, brickmakers at Ashby Road, Winshill, Burton and Snobnall Road, Burton. Information by Martyn Fretwell. 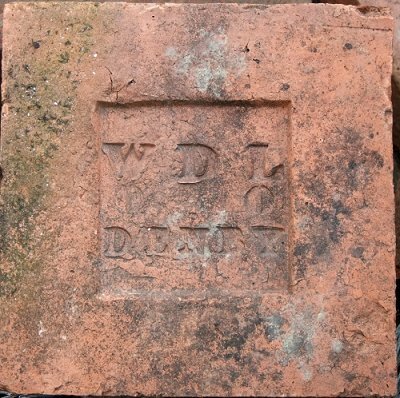 Ian Castledine writes: WDL stands for Wm Drury Lowe as in Drury Lowe Colliery in Denby, Derbyshire, found at Flamstead drift. W D L represent the Initials of William Drury Lowe a local landowner and industrialist. He owned several collieries in the Denby area in addition to the brickworks. The brickworks was sold to W H & J Slater in 1874. William Drury Lowe of Locko Park, Spondon was able to extend the lands and buildings he had inherited after he invested in the creation of the Derby Canal. 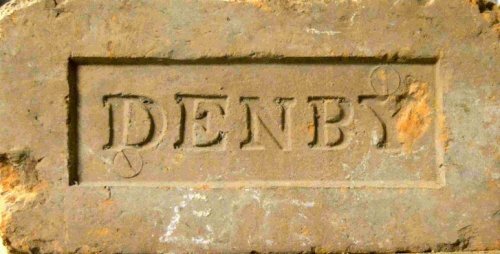 The canal made the collieries at Denby much more viable as the coal could then be transported around the country by canal, It is also assisted the creation of potteries at Denby which started on Drury-Lowe's land. Photo courtesy of Derby Museums. Info by Frank Lawson. Photo by courtesy of the Frank Lawson collection. The works was at Wharncliffe Woods to the north of Sheffield - found near Linacre Reservoirs, Chesterfield. Made by the partnership of George Edward Lowry and Walter Lowry. Thanks to George. Photo by Gordon Hull. Lucas had two brickworks one at Dunston and the other at Eighton Banks which are now part of greater Gateshead. Found at the allotment site behind Durham Cathedral and probably came from a building dating from the 1880-90's. The Lucas Brothers are listed in Kellys 1869 edition at Somerleyton, Suffolk with Daniel Knights recorded as manager. The brothers owned the works between 1854 & 1875. The 1882 OS map shows that a short section of canal was built to connect the brickworks to the nearby River Waveney & today this canal has been extended to form a marina. A web article states that the Lucas Brothers built a row of cottages using their own bricks next to the brickworks for their workers & these cottages still stand in the village today. 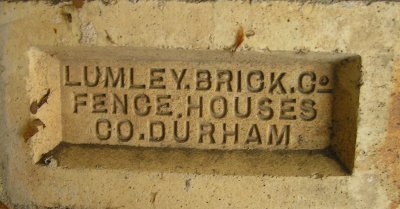 Also see Daniel Knights, Somerleyton Brick Co. & Norfolk & Suffolk Brick Co. entries as they are all the same works. Photo & Info by Martyn Fretwell. Robert Lucock, brick and tile manufacturer at Langrigg, in the parish of Bromfield, near Aspatria. Photo and info by Mark Cranston. Front and back shown. A. & Luke Ludlam, Boythorpe, Chesterfield, owned Boythorpe Colliery in 1858. Info & photographed at Chesterfield Museum by Martyn Fretwell. 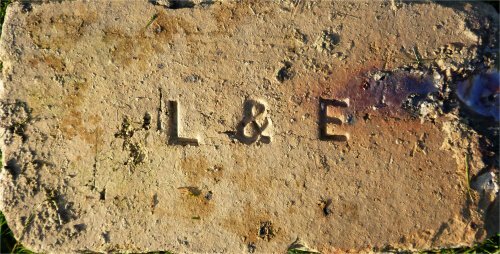 More than likely these two bricks were made at the Ludlow Brick & Pipe Works which was on Fishmore Road & was in operation from around 1884 and closed in 1948. There are three other options where these bricks may have been made. One was next door to the Ludlow works & was called the Fishmore brick & tile works & was in operation from around 1884 and closed in 1903. The third brickworks was at the end of Belle Vue Terrace, todays Quarry Gardens is built on this site and this works is shown on maps from 1884 to 1924 & was closed by 1926. The fourth was the works owned by John Sheffield located next to the town's railway station and was operational in the 1890's. Info & Photo by Martyn Fretwell courtesy of Shropshire Museums. Found near Alfreton by Frank Lawson, Luke Evans, brickmaker of Alma Street, Alfreton. is recorded in Kelly's 1901 Trade Directory. This one is from Chester-le-Street and features a representation of Lumley Castle, thanks to Simon Patterson for the photo. Found on Roeburndale Road, Caton Moor, Caton, near Lancaster by the site of the former Brookhouse Brickworks. 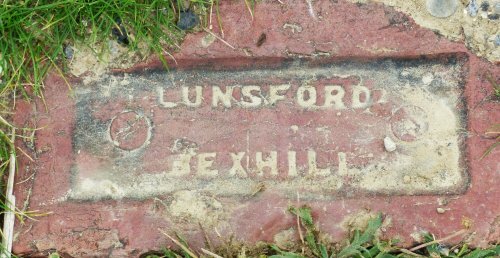 LUNE, BROOKHOUSE and LUNE 1965 bricks can all be found close by the former brickworks and so it is quite possible that this was made at the Caton Moor site. 'Rural Industries of the Lune Valley, Winstanley 2000' states the works operated between the early 1920's and the late 1960's making quality bricks from the local shale. Image and info PRBCO. See also entry for Brookhouse. Embedded in the costal path behind Chesil Beach Dorset. Photo by Bob Kennedy. Made by H. Lustig, Goosegreen Lane, Thakeham, Sussex. Photo by Richard Symonds, taken at Amberley Chalkpits Museum. S Milner, Lydgate, Sheffield. White's Sheffield Directory 1857. Photo and info by courtesy of the Frank Lawson collection.